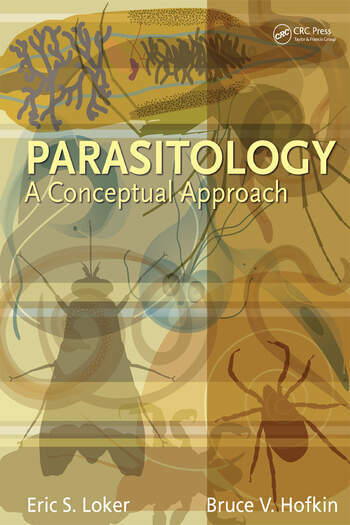 Parasitology: A Conceptual Approach is a new textbook for upper-level undergraduate and graduate students which focuses on concepts and principles without neglecting important aspects of a traditional, taxonomically based approach to parasitology. Concentrating on concepts enables readers to gain a broader perspective that will increase their ability to think critically about various parasitic associations. The interfaces between the study of parasitism and prominent biological disciplines such as biodiversity, immunology, ecology, evolution, conservation biology, and disease control are highlighted. End-of-chapter questions are provided, as is an Instructor Manual. Information on individual parasites is expertly summarized in a concise appendix called the Rogues’ Gallery. This appendix is organized taxonomically and includes details on taxonomy, life cycle, associated pathology, treatment, and control. Species included in the Rogues’ Gallery are highlighted in red throughout the main text. Bruce V. Hofkin received his PhD from the University of New Mexico where he is currently a faculty member in the Department of Biology. His primary research interest is the epidemiology and control of vector-borne and snail-borne diseases. Eric S. Loker is Distinguished Professor of Biology, Curator of the Division of Parasites of the Museum of the Southwestern Biology, and Director of the COBRE Center for Evolutionary and Theoretical Immunology at the University of New Mexico where he has taught parasitology and related courses for many years. His research interests focus on the biology of schistosomes.